Broad, opaque cornball poetry comes naturally to car movies. The subject matter is pre-packaged with images of escape, endurance, and death: fiery wreckage, the end of the road, a tachometer arrow inching into the red. Never mind whether lines like “He loved the impossible”—spoken by one of Need For Speed’s gearheads in memory of a dead friend—make any sense. A fast car roaring down the road, its driver gritting his teeth at each bend, makes for one hell of an image. There’s no shortage of squealing tires and straining engines in Need For Speed. Unlike the later Fast & Furious movies, which exist in a Road Runner universe where the laws of physics exist only to be broken, the movie emphasizes practical stuntwork. Its first and best racing sequence—set at night on the twisty streets of a small town—is a minor triumph of old-school craft, constructed without the use of music or the now-standard GoPro crash cams. 1970s camera moves meet new-fangled technology (namely, the Canon C500 camera; at times, the movie feels like a show reel for its low-light capabilities), resulting in a thrilling sense of movement and space, cars hurtling recklessly past oncoming trains and down alleyways in near darkness. With all this, the post-conversion to 3-D feels like an unnecessary afterthought. It’s no surprise, then, that director and co-editor Scott Waugh (Act Of Valor) happens to be a veteran stuntman. Need For Speed’s dialogue-centric scenes are often clunky, and its comic relief is at times embarrassingly unfunny, but whenever Waugh shifts his focus to figuring out how to best convey an ingenious practical stunt with the camera, the movie comes alive. 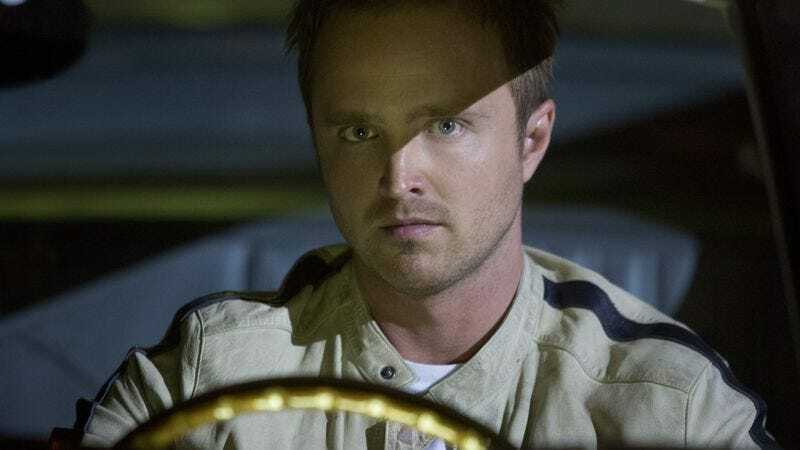 One single take finds lead Aaron Paul four-wheel drifting a $1.6 million sports car, bringing it to a stop within inches of the camera, and springing out from the driver’s seat before the doors have finished swinging open. It’s electrifying to watch, especially since the framing and duration of the shot establish that Paul is doing the stunt himself. Need For Speed’s drama lies in its stunts, not in dialogue. The thin and often ludicrous plot—which involves freshly paroled street racer Tobey (Paul) driving across the country to compete in a secretive high-stakes race and clear his name—hits on every iconic location in American car culture: a desert highway, the streets of Detroit, the Bonneville Salt Flats, the up-down hills of San Francisco, the California coastline. Though nominally an adaptation of EA’s long-running game franchise, the movie mostly feels like an excuse to catalogue car-related pop culture. There are scenes in trucker stops, clubhouse-like body shops, middle-of-nowhere gas stations, a drive-in movie theater (showing Bullitt, no less), and gleaming luxury showrooms. The late car designer Carroll Shelby plays a role in the plot, and Speed—on which Waugh worked—gets referenced in the dialogue. The only things missing are a demolition derby and a scene set in L.A. traffic. At 130 minutes, Need For Speed is probably too long for its own good. Despite the simplistic set-up, complete with a villain (Dominic Cooper) so evil he’s introduced wearing a black turtleneck in warm weather, the movie is so crammed with automotive iconography that it requires a Greek chorus-like narrator (Michael Keaton, who spends the entire movie spinning around in a swivel chair) to periodically remind the viewer that there’s a plot. Two things sustain the movie across its lengthy running time: Paul’s fine performance—which is a good deal more believable and naturalistic than the material probably deserves—and Waugh’s direction of its many car chase scenes. Though later sequences lean a little too heavily on contemporary car flick clichés (like the aforementioned GoPros), they are all nonetheless informed by a gee-whiz appreciation for gleaming cars and stunt driving ingenuity. Sometimes—as in the sequence where a fiery sports car tumbles off a bridge in slow motion—Need For Speed manages to capture that ineffable car movie poetry, freedom and death commingling in the image of a single airborne wreck.